Ganeshpuri temple is known for Nityananda Maharaj and Swami Muktananda deities and followers are the most among other who visit this temple. 28 Kilometres from Virar this holy place is known and famous for one more attraction it has which is a Natural hot water springs. 2 such springs which are open to public are within temple premises. This is one of the very oldest temples near Mumbai and is said that spiritual personality people like Sai Baba has also visited here. Far inside villages which are homes to Adivasis and Warli community people, One can hardly see signs of urban development here. But since the tourism boomed, resorts and stay options are seen been recently developed for tourists convenience and commercial benefits. As said their is no special attraction when it comes to looks and feel of holy temple. Since decades the structure is as it is, Attractive and rarely seen but same old which is properly maintained. If you are Bhakt / Devotee and follower of any of the 2 personality as listed above, you must visit this temple. 2 Hot water springs are adjacent to each other and open during day time till evening 6:00 around. But if you are in Virar for some reason and have couple of extra hours to spend and hang around, this will be a worth place especially during monsoon as the path from National Highway (Shirshad Phata) towards Ganeshpuri is lust green and scenic. See the video below taken at around unset, Also below is a very short video of Hot Water Spring as it was not allowed. Nityananda was a saint and is referred to as Baba in Hindi. Till 1936 he use to stay at Vajreshwari and then moved to this nearest village of Ganeshpuri which has these Hot springs. Early morning he use to take bath in natural hot water springs around village and then use to meditate at near island area of Bhimeshwar mahadev around flowing river. He built this kund (Hot water springs) and asked villagers to take regular bath as it was sacred. He took Samadhi (Meditative consciousness) here, in the 1960s. Temple is maintained by ‘Shri Bhimeshwar Sadguru Nityanand Trust’ and their is loadging and food facilities inside by the trust. Day time one can enjoy prasadalaya and other food like Medu vada or Proper lunch thali all below Rs.50. On a Direction board near temple are details of surroundings like Samadhi Temple ( Meditative consciousness by Nityanand Maharaj), Trust Office, Temples like Shri Krishna, Navgraha, Shri Bhimeshwar Shiva and Shri Bhadrakali Goddess, Kailash Nivas where Baba stayed, Kids Garden, Parking location, Cow Shed, Toilet facilities, Canteen for food and Small Museum inside. Nearest Station : Virar on Western Railway Route via Local Trains, about 1 and half hour in train from South Mumbai. Travel Options : MSRTC Buses from Virar West Depot near Railway Station, VVMT Buses from same location, Auto From Virar East which may charge around Rs.300 to Rs.400 lumsum as no Meter System here. By Car : On National Highway 8, From Virar towards Ahmedabad at just 1 km distance is Shirshad Phata, Go straight from their at about 15 Kilometres is Ganeshpuri and Vajreshwari temples. Enough parking options are available (Free Parking Near Temple). Around 1936 when Nityananda baba came to Ganeshpuri from vajreshwari, He found this water springs and developed it to welcome villagers to have bath declaring it as sacred. Now in 2016 as the penetration on tourism industry had multiplied, This geothermal heated ground water is frequented by thousands, and many might have skin related diseases. So to get into sacred kund’s or not is your personal choice as no checking related same is done before allowing people to get in. Vajreshwari temple : At just 1 kilometre from Ganeshpuri, at few meters from Vajreshwari is a flowing river with another few Hot water springs. Mahavir Dham : A Jain temple at Shirshad Phata, Its exactly on Virar National Highway Shirshad Phata from where you take a turn towards Ganeshpuri. 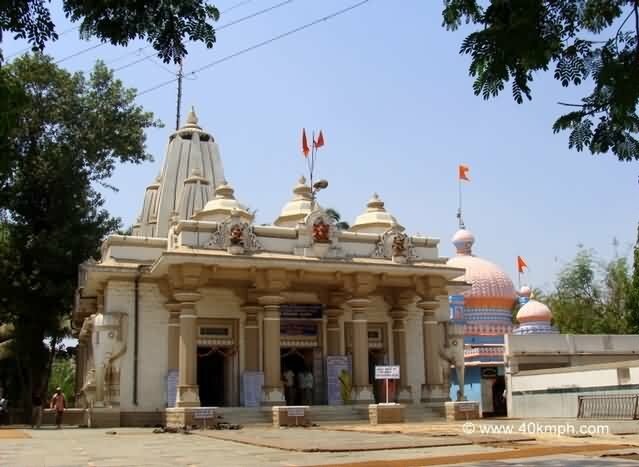 Jivdani Mata Temple : Inside Virar is this very famous as it is located high on mountain with more than 1000 steps to climb, It does have a rope way option too. Agashi Jain Temple : 5 to 7 Kilometer from Virar Railway Station (West) towards villages. Arnala Beach : One of the famous beaches in Virar, It has a fort and few adjacent beaches much cleaner comparatively.